Do you need a crown on a front tooth with a root canal treatment? Just had a root canal on the tooth right next to the front tooth. Is it necessary for a crown to be put on ? Can a post only be put in and if so, repair the discoloration with a porcelain veneer ? There’s a simple answer to your question and a more thoughtful answer, and I’ll give you both. The simple answer is that dentists were taught in dental school that if a tooth has a root canal treatment, it is weakened, and thus it needs a crown to strengthen it and prevent tooth fracture. Plus, after a root canal treatment, a tooth will turn dark, so a front tooth should have a crown to preserve its appearance. – Yes, a tooth is weaker after it has had a root canal treatment. But there is a difference between back teeth and front teeth. Back teeth, because they have a flat chewing surface and cusps are prone to splitting – the chewing force comes down between the cusps and this pressure tends to force the cusps apart. A crown will prevent splitting of the tooth. A front tooth, however, doesn’t have these forces. The risk with a front tooth is that chewing creates a horizontal force that may break off the tooth. 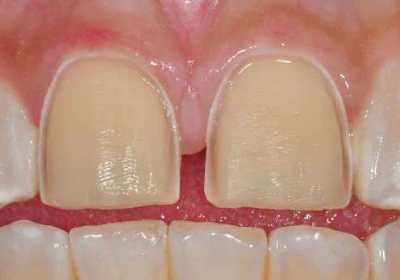 A crown, since it requires removing 1-2 millimeters all around the circumference of the tooth, will actually weaken it against these horizontal shear forces and make it MORE likely to fracture. On the discoloration issue, yes, teeth with root canal treatments will discolor. However, if the root canal cement and the root canal filling material are carefully cleaned out of the inside of the crown of the treated tooth, that discoloration will take years to occur and will be mild. My preference for a front tooth would depend on the amount of healthy tooth structure remaining in the tooth. If, say, 70-80% of the tooth is healthy tooth structure, I would recommend restoring the tooth simply with a translucent or white fiberglass post and composite. 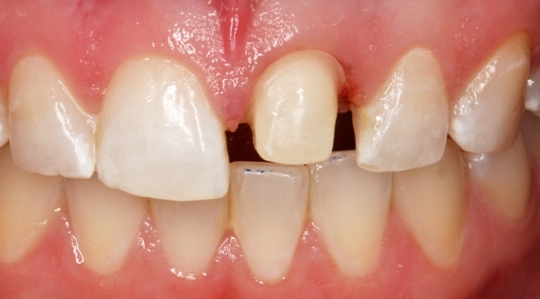 Then, when the tooth begins to discolor, that could be corrected with a porcelain veneer or a crown at that point. If substantial amounts of tooth structure are missing, I would use the same white or translucent post with an all-ceramic crown. Dr. Hall, For the past two months I have been experiencing slight pain, pressure, discomfort and even feeling as if my two front teeth are going to fall off. Hot or Cold do not bother my teeth. Approximately 9 years ago I chipped one and also had decay on my two front teeth. As a result, veneers were placed. Never had any problems until now. I went to a dentist that has been doing my cleanings and she did an x-ray and noticed inflammation on a nerve. Advised to take ibuprofen for 7 days for inflammation. I followed her instruction and it did work for 1-2 weeks until the same symptoms came back. I went back she took another x-ray, noticed the same inflammation. She stated if it continued then possible root canal would be the next step. However nerve had no damage, which it confused me as why she would do a root canal? I was advised from a friend that sometimes the nerve can be infected. I had some amoxicillin at home and took it for 5 days the pain once again was gone. Now 2 weeks later symptoms are back. My biggest fear is that veneers are going to fall off, is that possible? Even saliva feels weird around my front teeth only. Can you tell me if it may be possible for root canal? I’m at a little bit of a disadvantage not being able to see this myself, but at least from what you’re telling me it seems pretty clear that your tooth needs a root canal treatment. And I will tell you why I think that. I am interpreting the “inflammation on a nerve” that you are telling me about as signs on the x-ray of pulpal inflammation. When the pulp of a tooth is inflamed, often the first sign is either a widening of the periodontal ligament space around the end of the root, or a breakdown in the bony lining of the socket of the tooth, also occurring at the end of the root. When anything shows up on the x-ray like this that indicates inflammation of the pulp of the tooth, it is pretty certain that you are going to sooner or later need to have that root canal treatment. Taking some amoxicillin you had at home for a tooth infection isn’t a good idea. But the response of your tooth – the pain went away and then came back two weeks later – is another pretty certain indication that the tooth is infected, which means you need a root canal treatment. The problem with having taken the amoxicillin is that now you are that much more likely to have an amoxicillin-resistant infection in your tooth. You can never wipe out a tooth infection with antibiotics alone because the antibiotics have no way to get inside the tooth. So the infection will always come back, and the next time it’s always more likely to be an antibiotic-resistant infection. Your porcelain veneer won’t fall off this tooth if you get a root canal treatment. But let me give you some helpful advice on how to have this done so that you preserve the esthetics of your smile. And this is something that many dentists don’t know, unless they are really expert in appearance-related dentistry. There is a strong potential for a tooth with a root canal treatment to turn dark. That dark color will show through the porcelain veneer and will require it to be done over again unless the dentist takes this simple precaution. After the root canal treatment, the dentist needs to clean out all root canal filling materials and cement from the insides of the visible part of the tooth – the part that shows above the gumline. Then she should cement a translucent fiberglass post inside the tooth to reinforce it and fill up the rest of the inside of the tooth with a light-colored composite material that will preserve the original color of the tooth. It is the root canal filling material and cement inside that cause most of the discoloration of the tooth. But by cleaning all that out and filling it as I have described, it won’t permanently prevent any discoloration of the tooth, but it may put it off for a good five to ten years. At that point you can get new porcelain veneers or go to a crown on the tooth. Show this e-mail to your dentist, and she can contact me if she has any further questions. Having this delayed response to the traumatic injury and decay you experienced 9 years ago isn’t unusual at all. Most dentists have seen this sort of thing before.